Summer of No Regrets POS packs – Bounce Sales & Marketing Ltd. Create a summery, eye-catching display with a Summer of No Regrets POS pack. 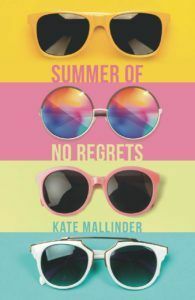 Four friends pledge to make their summer regret-free but will it be that simple? A diverse, feel-good story of friendship, irresistibly escapist, with a strong theme of ‘seize the day’, perfect for the current ‘up-lit’ trend. Firefly Press have packs of A4 posters, bookmarks and pin badges featuring the summery cover artwork.